A recent newspaper reported that a prominent publisher of maps deleted Israel from maps sold to schools in some middle-eastern countries. Indirectly, schools who use the maps teach that Israel does not exist, and that Jews are usurpers of the land with no legitimate claims. It was another reminder that children can be educated to hate. Sadly, if you want to demonize Jews, there are unlimited ways to do this; the textbooks in many Arab schools and the Arab media promote a vision of the Jew that is easy to detest. I thought of this as I watched a scene in Mississippi Burning, a powerful film about racial tensions in the South, which focuses on the killing of three civil rights workers in the 1960s. In one scene, a Ku Klux Klan leader brands Negroes, Jews, and Catholics as un-American and as minorities who are destroying the fabric of American life and its morality as well. The camera pans on faces of adults and children who are listening attentively to his speech. They are innocent faces, but they are being taught to hate. The story opens in 1964, when three civil rights workers are killed. At first it is a missing persons case, but the FBI sends two agents, Rupert Anderson, played by Gene Hackman, and Alan Ward, played by Willem Dafoe, to Jessup County, Mississippi, to investigate the details of their disappearance. The townspeople are reluctant to talk to them and getting the truth becomes difficult. A culture of hate is ingrained in the community. Moreover, the more the FBI invests its manpower and time to solve the mystery, the more dangerous life becomes for the community’s black residents. Finally, the agents get information that leads them to the location of the bodies, and Anderson, using unorthodox methods, is able to ferret out who murdered them. The tense dynamic between Anderson, who is willing to break the law to get necessary information, and Ward, who wants to do things by the book, reveals the difficulty of ascertaining truth in a world where tradition trumps objective truth. Judaism teaches that all men are created in God’s image and possess infinite value. Therefore, everyone deserves respect regardless of color or creed. It is noteworthy that in the Bible Jews are instructed not to hate the Egyptians, even though it was the Egyptians who enslaved them. The commentators point out that the Egyptians initially provided a place of refuge for the Jews during a time of severe famine. Moreover, it was the daughter of Pharaoh who saved Moses. The commandment not to hate the Egyptian essentially tells us not to carry past animosity with us. To be a free man, you have to let go of hate and not allow it to dominate who you are today. It is instructive to note that when Miriam, Moses’s sister, criticized Moses for marrying a Cushite woman, a woman with dark skin, she was punished with leprosy. Furthermore, the Song of Songs, written by King Solomon, states “ I am black but beautiful.” A different color does not connote inferiority. 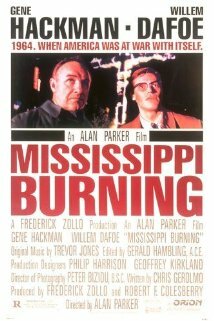 Mississippi Burning on one level is a superb crime thriller, in which we follow the dogged pursuit of the law towards apprehending the murderers of three innocent young men, whose only crime was to work for the civil rights and liberties of all Americans. On another level, it is a cautionary tale about what happens when people blindly accept narratives of hate about others and make them the operative principles for managing relationships with those who are different from them.